International Journal of Research in Health Sciences,2015,3,2,295-302. 1Assisstant professor, SVMC and SVRR General hospital, Tirupati. Andhra Pradesh, INDIA. 2Associate professor, SVMC and SVRR General hospital, Tirupati. Andhra Pradesh, INDIA. Introduction- acute intestinal obstruction is one of the commonest surgical emergencies in all age groups with similar mode of presentation but a variety of causes.The age old dictum of " never let the sun set or rise in small bowel obstruction" holds good to reduce the incidence of strangulation. Success in treating intestinal obstruction depends on the cause and also on skillful management and appropriate treatment of pathological effects of intestinal obstruction. Objectives- to study the common causes of intestinal obstruction faced by a general surgeon and to study methods of early diagnosis and intervention for better outcome. Materials and Methods-- Cases admitted in the department of General surgery, Sri Venkateswara Medical College and SVRR hospital between july 2009 to november 2011 forms the material of the study. Investigations used in this study along with clinical examination are biochemical, radiological and others. 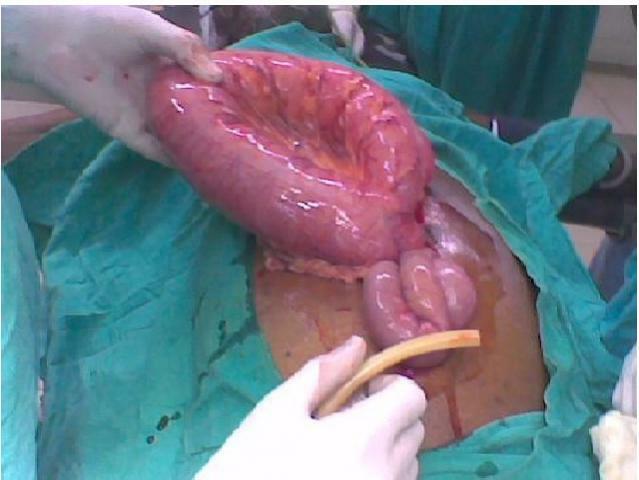 All patients in whom a diagnosis of intestinal obstruction was established on admission and confirmed during operation between July 2009 to November 2011 were included in the study. Patients admitted with the diagnosis of intestinal obstruction and treated conservatively, cases of gastric outlet obstruction and pediatric age group are excluded from the study. A total of 135 cases are included in this study. Results -The age varied between 14 and 85 years. Mean age was 48.9 years. The maximum no. of patients, 29[21.48%] belonged to 61-70years age group. In this study totally 93 males [68.89%] and 42 females [31.11%] were studied. The male to female ratio was 2.21:1. The most common cause was obstructed hernia, 36 cases [26.67%]. Next comes the adhesive intestinal obstruction, 35cases[25.93%]. Adhesive obstructions were decreased because of availability of minimally invasive surgery. Conclusion-The most common cause was irreducible hernia, next the adhesive obstruction followed by Sigmoid volvulus, Tumors, Ileo-caecal tuberculosis, Mesenteric ischemia, intussuception and others. From this study, abdominal pain, vomiting, constipation, distention of abdomen are the most common features of intestinal obstruction. Fever and Tachycardia were present in majority of cases. Shock was associated with high mortality. Surgical intervention, when early, considerably reduced the mortality.